The Calgary Zoo is planning to switch its four-year-old tiger Kira for Karma, another four-year-old Amur tiger from the Cherry Brook Zoo in Saint John, N.B. While they serve as entertaining and informative attractions, zoos also play a critical role in preserving species that are threatened by extinction. In order to sustain endangered species, sometimes zoos will exchange animals to expand specific gene pools. 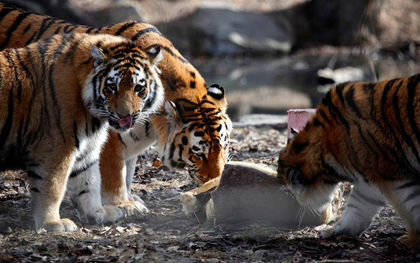 Trish Exton-Parder, spokeswoman from the Calgary Zoo, said the trade is not yet 100 per cent confirmed, and that they are waiting for the go-ahead from the Species Survival Plan (SSP) organization. She explained SSPs are “organized breeding recommendations for animals under the care of accredited zoos,” and that the Amur tiger is one example. In this case, the move is an exchange or trade of animals, but Exton-Parder says it does not always happen in this manner. The important factor is that both animals were well-matched for each other, but in other instances a zoo may send an animal to another facility without getting another in exchange. Global will continue to follow this story as it unfolds. Officials said the trade could happen by September 2016.